This collection consists of records related to the United Nations (UN) Convention Against Torture, officially adopted by the United States on October 21, 1994. 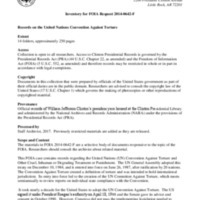 It contains correspondence, reports, memoranda, cables, and Congressional materials regarding the implementation of the Convention Against Torture and assistance to victims of torture. In addition, these records contain a discussion of alleged terrorist Hani el Sayegh’s claim under the Convention Against Torture prior to his 1998 extradition to the Kingdom of Saudi Arabia.